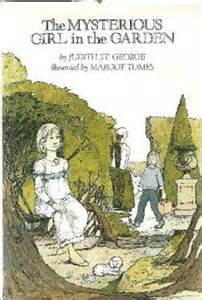 Today's Timeslip Tuesday book is The Mysterious Girl in the Garden, by Judith St. George (1981). It's a rather straightforward, simple of plot and character story that is nonetheless not without charm. An American girl, Terrie, is forced spend the summer in London, tagging along with her mother to Kew Gardens every day (her mother is studying there). Terrie is sullen and bored; she wanted to stay with her grandma on Cape Cod for the summer instead. And so she is rather deliberately not having a good time. But then a little dog comes out of the shrubbery, though dogs are forbidden in the gardens, and Terrie follows it back, and meets a strange girl named Charlotte, who says she is a princess. Terrie is naturally skeptical, but soon she realizes that the little dog acts like a messenger to bring her back two hundred years to the reign of King George III. Charlotte is his grand-daughter, and being rather bored herself, she's glad to make friends with Terrie. And nothing much happens except for Terrie visiting Charlotte quite often, until Terrie takes Charlotte's places so Charlotte can go visit her mother for the day (something her grandfather, the king, has forbidden). Terrie almost gets found out, but makes it back to her own time safely, and that's the end. But though it is slight, it is rather vivid and magical. If you are nine or so and easily pleased by gardens and times past and magic that's totally unexplained and you like little dogs and like to read about girls becoming friends and dressing up in 18th century clothes, you will find it enjoyable. There's no deep point to it; it's basically just a nice thing that happens to happen to Terrie that makes her summer better. Since so few of us are in fact nine any more, it's hard to actually Recommend this any more recommendingly, but I'm happy to have read it; it was nice and soothing on a cold wet December night! Thanks, Anamaria, for sending it my way! I've only recently started reading this blog, so sorry if I'm recommending things that you've already reviewed! Tom's Midnight Garden by Phillipa Pearce has been one of my favourite books since I was about eight - it's about a boy who finds himself in a Victorian garden at night with a little girl, Hetty. It's amazing. Charlotte Sometimes by Penelope Farmer is a book I found recently about a girl who slips back in time (and into another body) when she sleeps in a particular bed at her new school. Here Comes A Candle To Light You To Bed (published in the USA as The House on Hound Hill) is a book by Maggie Prince that I read years ago - it's maybe more YA than kids, and has a girl travelling back and forth in time to 1665, and the Plague. Thanks! The first two I a very fond of, and have reviewed the already, but the third is new to me, and I will look for it. Well, I'm far, far past the nine mark but I too am easily pleased by gardens and times past and magic that's totally unexplained and like little dogs but I think I would also really like this one! I'll read anything set in Kew Gardens! The trees there are so huge and old it's easy to believe you could go back in time. I remember loving Tom's Midnight Garden. Haven't read it in a long time. I'm also reminded of Children of Green Knowe (more of a ghost story, if I remember correctly, but I think there was a bit of time travel, maybe?). There is a Green Knowe that's straight time travel--The Stones of G.K. I think the first is just ghosts...but very good. This sounds fun. I have a granddaughter who just might like this one. Thanks for the review.